MOST NAGYON FIGYELJENEK A DEVIZA KÁROSULTAK! 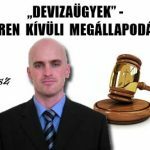 DEVIZAÜGY – MI CSAK A JAVAITOKAT AKARJUK! DEVIZAÜGYEK-ALKUPOZÍCIÓ. INGATLAN VÉGREHAJTÁSA AZ ÚJ SZABÁLYOK SZERINT. MI, AZ ADÓSOKAT KÉPVISELŐ ÜGYVÉDEK MEGYÜNK ELŐRE TÖRETLENÜL. 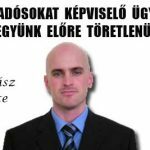 DR. CSIKÁSZ-„DEVIZAHITELEK” AVAGY JOGBIZTONSÁG, OBJEKTÍV ÉS TISZTESSÉGES ÍTÉLKEZÉS.